I've been wondering what the period can be of a planet or moon oriting at the hill sphere at distance r .
gives the radius (or Sma) . Amazingly the period t of the orbiting moon is easily derived as : t= T * sqrt ( (1-e)^3)/3). or in case of a circular orbit of the planet as : t= T * sqrt (1/3) . In case of the Sun-Earth-Moon system the t becomes : 1 year/1.73 or about 7 months!. however HillSphere * (Phi/e)^Phi^(e/2) is stable for prograde orbits and HillSphere * (Phi/e)^Phi is stable for retrograde orbits. where Phi is the golden number (sqrt(5)+1)/2 and e is the natural number. I'll be posting my work on binary stellar bodies, binary planets, dwarfs, and sssbs; sometime in the next week or two. I used empirical data and then extrapolated from the data. Retrograde moons with axes up to 67% of Hill radius are believed to be stable. This statement from the article is disputable as there is not reference to it give in the article. and there is another article that better explains the Hill Sphere http://en.wikipedia.org/wiki/Hill_sphere#True_region_of_stability Using simulations of n bodies, HillSphere * (Phi/e)^Phi was the maximum range That I could keep a retrograde orbit stable indefinitely. Thanks for the information abyssoft. Aside from your scepsis about the article I think also the influence of other planets such us Saturn may come into role ? Time to set up a GravSim ? BTW : the title above is not that good . It should rather be : ....- another representation. My view on binaries from an analytical view point with applied mathematics. "Once the hill sphere has been determined next we need to determine the semi-major axis outer boundary for pro-grade orbits; this is done by taking the hill sphere * ( Phi / e ) ^ Phi ^ ( e / 2 ). Just to insure we have all necessary data points we should also calculate the semi-major axis outer boundary for retrograde orbits; this is done by taking the hill sphere * ( Phi / e ) ^ Phi. " I have known the Hill sphere as an upper limit of stable bound orbits , but I'm curious to see how te above formulae were derived ? Created the Sun-Jupiter system , added 300 zero masses at 0.15AU+/-50% around Jupiter and let run for ca. 40 years , at a small time-step. A lot of exit the system , but about 20% stay stable. 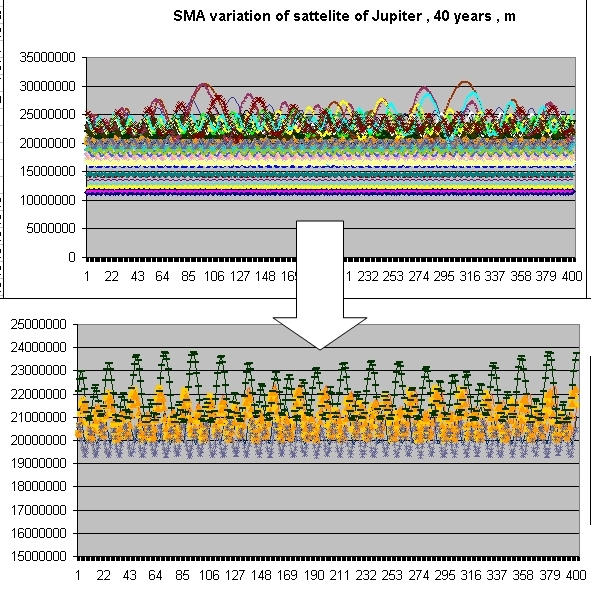 The result of the output in Excel ( after deleting the instable ones ) shows the variation of the SMA of the bodies which can be accepted as being "stable". The more closer they start the less variation in SMA occurs. Looking at the picture I guess one can attribute a maximum SMA of about 22.000.000 km for this system , or perhaps a little bit more . This corresponds with 0,41 rHill. BTW : running this system makes really fun. One can see the ring of bodies becoming elleptical , keeping a circular "bulge" . Instable ones leave the system creating "arms" . Looks like a small galaxy. If wanted i can provide the .gsim . I derived them empirically by plotting out the data and performing curve fitting the best curve fit I could achieve where those that are the result listed in the paper. It was not through any advanced mathematical process. note that my curve fit does not take in to account any other force other then gravity. and I now have bad news my older XP box has now died and I can no longer run simulations as I an unable to get GravSim to run stably on my vista box. Is there a problem with Vista running GravSim ( and other applications ?) . I still hesitate to convert from XP to Vista. What kind of Vista problems are you having? This is the first report of Gravity Simulator / Vista problem I've received. the last beta copy I had always locked up. ok found a way to make sure it works correctly. redownload, Right click and goto properties, unblock file, run as admin to install. redownload all of the latest beta, again right click and goto the properties of each and unblock file. Here's an animation of a gsim simulation about the Hill Sphere . Around Jupiter (in the center) are orbiting 300 1kg masses in retrograde orbit . Orbits are initially circular , at random positionned at 0.2 AU +0.2 . One sees the system quickly evolve towards an elliptical system and even to a system with spiral arms at opposite sides of the central Jupiter . At first I wondered why the spiral arms are created at both sides , but then I realised this is due to the "tidal" effects of the sun. This is at first glance contra-intuitive . I have the impression that a retrograde system allows much more eccentricity in the orbits than a prograde system . BTW ; is there any way to attach also the .gsim file in the same post ? The system doesn't seem to accept multiple attachments.